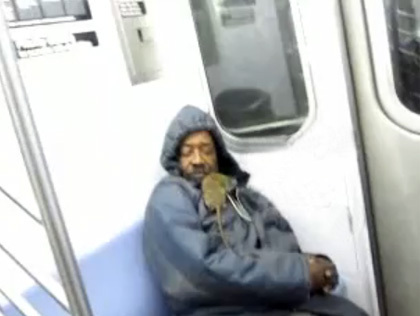 (CBS) A viral YouTube clip posted this week shows a rat scurrying through a New York City subway car and eventually coming face-to-face with a sleeping rider. If close encounters between rodents and humans creep you out -- do not watch the video below. I was sitting there listening to my iPod and I heard a woman scream," Jeffrey Ford, who recorded the video, told 1010 WINS. "When I looked up I didn't know what happened but I saw a rat on the floor. "I just reached straight for the camera. I've never seen anything like that before in my life, and I knew I had to document it," he said. For the record, New York City's MTA Rules of Conduct forbid anyone to "sleep or doze where such activity may be hazardous to such person or to others." Though, waking up with a rat in one's face is not listed as a possible punishment for such a violation.